Inspired by footwear he had seen in Japan, businessman Morris Yock and his son Anthony began manufacturing this simple rubber footwear in their garage in 1957. The name ‘jandal’ combined the words ‘Japanese’ and ‘sandal’. There is some dispute about whether Yock invented the jandal. The family of John Cowie claim that he introduced the footwear from Japan in the late 1940s, coining the name ‘jandal’ in the process. They believe Yock only imported the jandals and applied for the trademark. Yock’s son disputes this. Jandals Ltd initially manufactured jandals using rubber imported from Hong Kong; J. Yock & Co. arranged distribution. Skellerup took over the supply of raw materials and eventually bought the business in 1987. During the 1980s and 1990s the brand came under threat from cheap imported imitations. 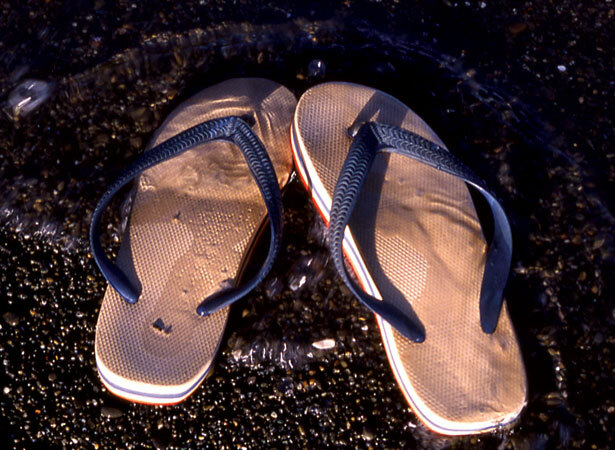 In response, the owners threatened legal action to protect the ‘Jandal’ trademark. A fresh stoush over the name broke out in 2014, when current trademark owners, Gentex (NZ) Ltd, asked a Hamilton-based retailer to stop using the term ‘jandal’ to advertise their footwear.